Where good beginnings never end! In a needs assessment survey conducted by the Huntingburg Chamber of Commerce in 1988, area residents ranked the need for a community day care center high on their lists. Thanks to St. Joseph's Hospital and many hard-working members in the community, that need was fulfilled. 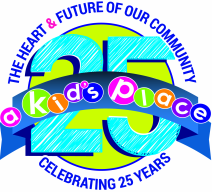 A Kid’s Place was founded by a group of concerned citizens striving to provide quality and affordable child care for Dubois County and surrounding areas. We are a not-for-profit 501C3 agency, and have been in operation since August 26, 1991. The daycare is governed by a Board of Directors comprised of parents, community leaders, health care workers, educators, and business professionals. Here is our first graduating preschool class!